Honestly, I’m not sure how Google decides what labels to show and hide. Probably it is based on how frequent you access those labels. But what makes me trouble is I always need to click twice to go to the label that I want to go too because those labels are hidden. Guess Google is not that smart and decides wrongly? You will see System labels as shown above and scroll down you will see your labels. 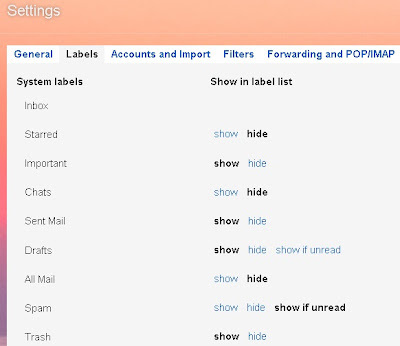 Just hide whatever you never use and show for those label that you use frequently so that you Gmail is not over crowded. P/s: I still prefer the concept of folder. It is much easier to move around and organize as compared to label.